Pictures are to scale: 1 cm is approximately 10 pixels. If you have any corrections, additions or remarks to any of the plates or their descriptions, please e-mail me. 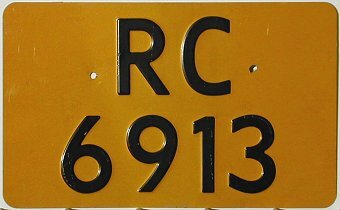 1951-1976 car plates in two different styles. 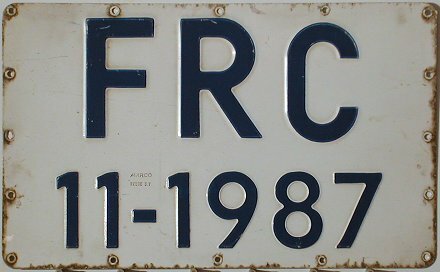 1976-1977 car plate. 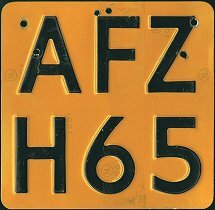 As can be seen from the inspection stickers, this plate was in use until the late 1980s. Temporary pair expiring in 1977. Note the different directions of the "77" year stickers. 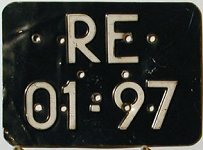 1977-2000 car plate. Rarer plate type with plastic characters affixed. 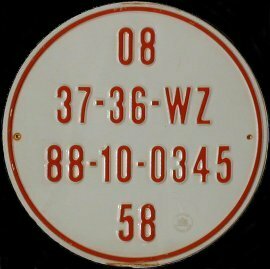 Moped plates for 1968 and 1980. Temporary plate expiring in 1980. Provisional plate. S = Gelderland provice, number below 23-99 = valid for 30 days. Provisional plate. T = Noord Brabant provice, number below 23-99 = valid for 30 days. 2000 onwards normal series plates. 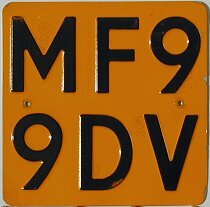 In 2000, new plates were introduced continuing the previous numbering series. There is now a blue Euro band, a painted raised border and a new font. In 2006 numbers with three letters preceeded by two numerals and followed by one numeral were intoduced. 2000 onwards replacement plate. 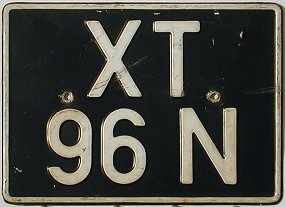 The small digit 1 indicates that this is the first replacement for a lost or stolen plate. This plate is misprinted, it should read 37-BJX-5. 1977 onwards reduced size plate for American cars. This type is still in the pre-2000 style without raised border and euroband. 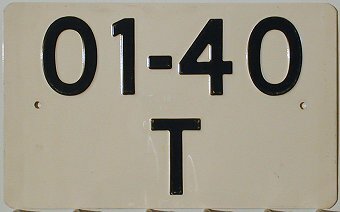 2000 onwards light trailer plate. Light trailers do not have a registration of their own, but display the number of the towing vehicle. Until 2000, that was on a normal yellow plate. Now special white plates (without the Euro band) are used to distinguish them from the car plate. 2000 onwards diplomatic plate. The number is purely serial with no embassy coding. Additional plate for animal trailers. 08 = 8 square meters trailer area, 37-36-WZ = The trailer's license plate number, 88-10 = expiration date, 0345 = serial number, 58 = type of livestock that can be transported. Additional plate for refrigerated trucks. 11-1987 = expiration date. These plates are so big, because they are mounted on the upper edge of the truck's side. Hoogovens steelworks truck plate, used only on private land. Personnel attached to AFCENT, pre-1992 series. Personnel attached to AFCENT, 1992-1999 series car and motorcycle plates. Personnel attached to AFNORTH, 2000-2003 series car. 2000 onwards official vehicle plate. 1975 onwards private vehicle plate. The E series started in 1997. Pre-2005 official vehicle plate. The numbering format conforms to the one used on standard US army plates, so I assume these are normal series US army plates made in Netherlands style to stick out less. 2005 onwards official vehicle plate. 12 = issued in 2012, SC = Schinnen Base.